Who doesn’t love a limited edition slasher double feature? Our first two slasher shorts, Teddy & Popularity Killer, are now available on a limited edition & hand numbered DVD including all new special features. Each dvd is hand numbered on the spine of the case out of a total of just 50. Once these 50 are gone, they are gone for good. Both films contain behind-the-scenes stills, commentary, trailers, and much more. See where Slasher Studios first began and cut into the slasher fun! Just $10 with free 11×17 poster with purchase, for a limited time only! Who doesn’t love a limited edition slasher double feature? Our first two slasher shorts, Teddy & Popularity Killer, are now available on a limited edition & hand numbered DVD including all new special features. Each dvd will be hand numbered on the spine of the case out of 50. Once these 50 are gone, they are gone for good. Both films contain behind-the-scenes stills, commentary, trailers, and much more. See where Slasher Studios first began and cut into the slasher fun! Just $10 with free 11×17 poster with purchase, for a limited time only! You guys asked for it, so we are bringing it back! Our first two slasher shorts, Teddy & Popularity Killer, are now available in a combo pack including all new special features. Each film contains behind-the-scenes stills, commentary, trailers, and much more. See where Slasher Studios first began and cut into the slasher fun! Just $10 with free 11×17 poster with purchase, for a limited time only! We are proud to announce our slasher short “Popularity Killer” has been received the award for Best Scene from Peculiar Film Festival. A big thank you to everyone involved with the Peculiar Film Festival and a huge thank you to the wonderful cast and crew of “Popularity Killer” for making this happen. 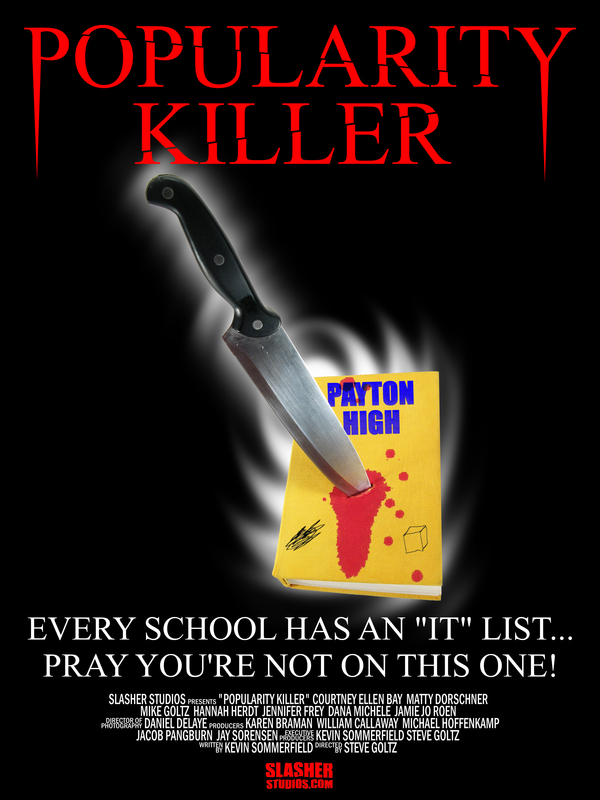 “Popularity Killer” stars Courtney Ellen Bay, Matty Dorschner, Mike Goltz, Jennifer Frey, Hannah Herdt, Dana Michele, Jamie Jo Roen, and Kevin Sommerfield. Directed by Steve Goltz and Written by Kevin Sommerfield. We at Slasher Studios are pleased and quite honored to announce that our three short films (Blood Brothers, Popularity Killer, and Teddy) have been nominated for a total of NINE Peculiar Film Festival awards!! You the horror fan get to decide the winners. The voting ends on Friday, March 8th so vote soon for your favorite Slasher Studios film. Thanks again everyone for all of the support! We couldn’t do it without you. This Friday join Slasher Studios as we watch our three short films, Blood Brothers, Teddy, and Popularity Killer, with you online live with a live Q&A after. The slasher fun doesn’t end there as our good friend Lucas Masson will be showing his slasher short Baby-Sitting (short film) and having a live Q&A as well. It’s going to be a night to dismember! 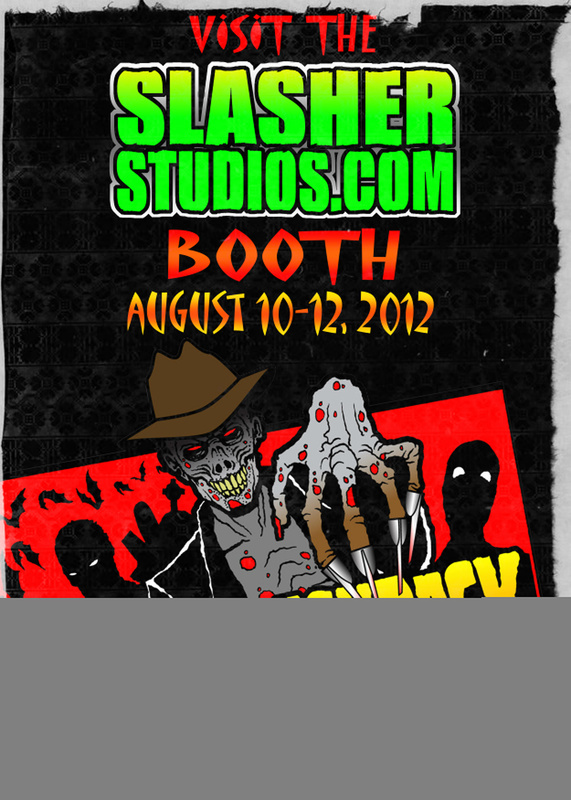 Visit Slasher Studios at Flashback Weekend! Hey slasher fans! We’ve been hard at work on “Blood Brothers” for the last couple of weeks and we can’t wait for you to see the final film. We think it is by far and away our best film to date. Speaking of Slasher Studios, we hope to see each of you at Flashback Weekend next weekend in Chicago, Illinois. We will be giving away some awesome prizes and have couples of all three of our films “Teddy”, “Popularity Killer”, and “Blood Brothers” for sale with some exclusive extras. If you can make it, we hope to see you there. Make sure to get your passes soon because Flashback has reported that they are almost sold out of many of the premium packages. So come visit Slasher Studios and support independent horror. Mention this post at our booth and get a FREE mini poster with any purchase! Have you seen our slasher shorts Teddy and Popularity Killer yet? Well here is your chance to not only watch them but to help us get to the horror final rounds at SeeFlik. It’s easy to do, just click on the links below to vote for our films. Just click FLIK, that’s all you gotta do! You can long in using your facebook or your twitter accounts and you are ready to go! Thank you everyone for the support that you’ve shown our films lately and let’s see these two slashers get to the finals! Check out the exciting teaser trailer below for our second slasher hit, “Popularity Killer” and make sure to order a copy today. Supplies are limited so get one while you still can! “Popularity Killer” stars Courtney Ellen Bay, Matty Dorschner, Mike Goltz, Jennifer Frey, Hannah Herdt, Dana Michele, and Jamie Jo Roen. Directed by Steve Goltz and Written by Kevin Sommerfield. We now have the OFFICIAL, final poster for “Popularity Killer”, make sure to check it out below. For those of you who haven’t preordered it yet? What are you waiting for? Click on the link on the right side bar and enjoy the slasher goodness.